Intensive development efforts have produced this range of cleats that provide unbeatable holding power, yet are designed for easy cleating and releasing of control lines in every application and load condition. 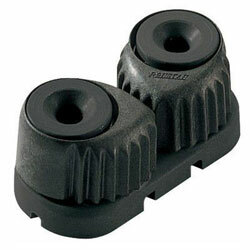 Ronstan cam cleats are strong, light and corrosion free. Through the use of advanced composites, these cleats achieve superior performance while overcoming the limitations of metal alloys. The unique tooth profile and cam geometry are designed to grip without damaging the rope. A multi-coil spring recessed in the upper part of the cam generates near constant torque. This constant torque ensures secure cleating of even the smallest lines with minimal abrasion or rope wear and low line entry and exit efforts. The lightweight ultra rigid carbon fiber composite cams of the c-cleat are corrosion free, suffer virtually no tooth wear and are non rope abrasive. Design, materials selection and advanced manufacturing methods combine to deliver superior strength and holding power, light weight and corrosion resistance. Cam profile and multi-coil spring minimize line entry and release effort. Carbon fiber composite cam material provides maximum resistance to heat and abrasion. Unique self-cleaning, self-lubricating slotted bearings ensure consistent high performance even when subjected to high static loads.